Recently Ambassador Negroponte stated that the United States supports the Efforts of Nigeria to reign in the activities of MEND and other Militants in the Delta Region. Earlier this year ABC News did a piece asking if they were Terrorists or Insurgents. So why is America Interested there? Over 20% of the Oil imported by the United States comes from the Western African State of Nigeria. The Niger Delta which is one of the most impoverished parts of Nigeria is the home of the lifeblood of the World's Industrialized Nations. The Ambassador made assurances to the Nigerian National Security Advisor and the Minister of Defense that the US will assist in ending the criminality in the Niger Delta. The area has been known for Several High Profile Attacks on the Oil Industry and Government Installations. Kidnappings are done as a for profit business. Here you see the Map of the Oil Wells that Royal Dutch Shell has in the region. Some of these areas have been attacked by Militants over the last couple of years. 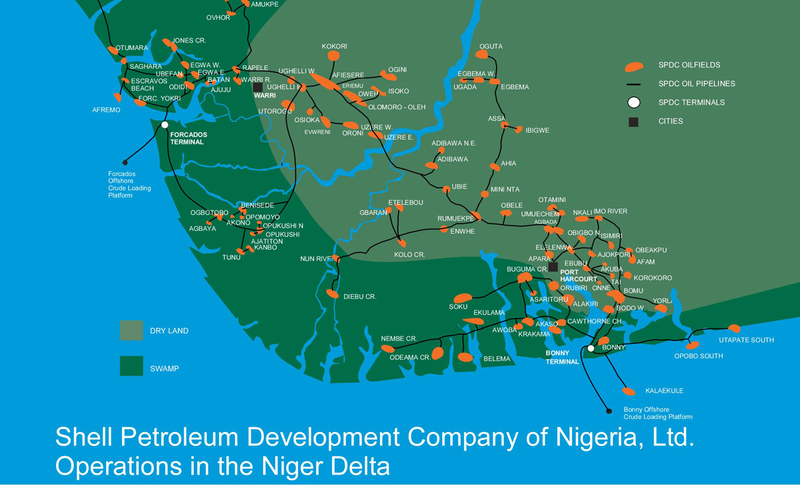 MEND (Movement for the Emancipation of the Delta) seeks to end the Exploitation of the Region by the Government and Multi-National Oil Companies. The money that the Federal Government in Nigeria has spent very few of those dollars in the Delta itself. They have used fast attacks using Speedboats to attack multiple targets at once. The Oil Companies have hired their own security forces as well. MEND has been able to use improved Weapons and Tactics to overwhelm these forces several times. One thing that the US wants in Nigeria are transparent elections. The Presidential Elections that were held earlier this year ended up having a new Government in place but there were concerns about legitimacy of the elections. Improvement in the Electoral Process is a benchmark in any future US Assistance. Nigeria is important to US Security in the Gulf of Guniea. Let us hope that the efforts by the US in the region pay off.